Posted by The Front Porch Gourmet | Chef M in Desserts, Notes from the Kitchen, Recipes, Saturday's at the Hassienda, Southern Comfort, Tailgaiting & Football! Do you ever just want something? Like you’re not hungry but just, I don’t know…WANT something? You can’t quite put your finger on it at first, but then slowly, the image starts to creep into your mind, and to your taste buds. I want something salty? No, sweet. Yeah sweet. And not candy, but cakey. But not really cake, and not syrupy sweet. Not chocolate. Not fruity or a cobbler this time. Something like maybe a…a….doughnut! A doughnut! 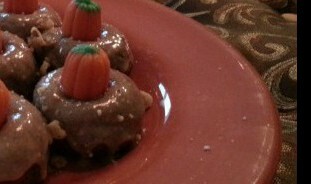 A pumpkin doughnut. With Maple glaze dripping down the sides topped with crunchy, buttery crushed walnuts. That’s it! That’s what I want. Pumpkiney, cinnamoney, mapley, nutty, goodness. Preheat the oven to 350. Grease doughnut pans, or doughnut maker, with non-stick spray. Beat together the oil, eggs, sugar, pumpkin, spices, salt, vanilla and baking powder until smooth. Add the flour, stirring just until smooth – some lumps will remain. Fill doughnut pans. Bake the donuts for 12-14 minutes, until a toothpick inserted into the doughnut comes out clean. 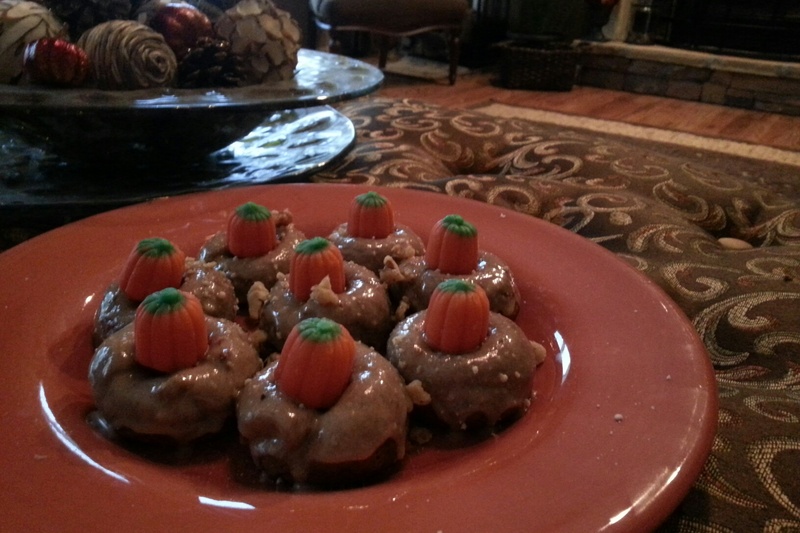 *If you are using a mini doughnut maker, bake for approximately 3-5 minutes. Remove the donuts from the oven/maker, let cool in pans for 5 minutes, and then turn out onto a wire cooling rack. While the donuts are still warm, dip them in maple glaze, allowing the excess to drip off on a cooling rack. Top with crushed walnuts or toasted pecans. Serve warm. With milk. Or hot cider. Mmmm.